Do you feel like you need to hire twenty more people for your business? Not sure whether the business can afford or justify them? Whether you’re thinking about your first employee or your 20th, how do you actually decide when to hire? There’s so much talk about delegating and needing to hire in order to grow, but how do you know when you’re ready to take the next step? Often business owners tell me they know they need to hire someone but they don’t have the courage to do it. Others seem to hire freely, but then often run into cash flow issues (the biggest cause of businesses going bust). Obviously the middle ground is the place to be, but how do you find it!? The first thing to get clear on is which positions you’ll hire next and in what order. To do this, I like to imagine a time – perhaps 3 years from now – when the business will be bigger. What would you like your organizational chart to look like at that time? What roles would you have in the business? What would your role be? Sketch out an org chart and make some notes about the main responsibilities or duties of each position. Ask yourself which of those roles would make the most sense to have someone else do. Think about both the needs of the business and your own personal needs. Keep in mind the areas where you add the most value and plan to maximize the time you can spend on those areas. I’m sorry, but being busy isn’t a good indicator that you need to hire someone. Yes, you might be frantically trying to keep all the balls in the air and doing the jobs of several people, but there’s a good chance you need to prioritize and get focused. More importantly, the question about when to hire comes down to understanding whether the business can support and sustain another employee. To figure this out, look at the actual metrics of the business – in particular, the revenues and profits. Unless you are a funded startup, your actual ability to earn money from clients should determine whether and when you can add new people to your team. What will this new person cost per month? (Think about a fair salary and then add 10% for on-costs.) Check if the business is regularly making that amount in monthly profit (after paying you of course). If not, what revenue level do you need to reach in order to support that position? This becomes the milestone you’re aiming for before recruiting. Forget about hiring someone until the business reaches this level. Business owners that haven’t done much recruiting often make the mistake of thinking it’s a quick and easy process to hire employees. Unfortunately that’s not true. Like pretty much everything, there’s a lot to learn and it takes more time and effort than you’d imagine. Of course it’s worthwhile doing, but it’s not worth rushing and getting the wrong person in the role either. Take the time to really understand the role you’re recruiting for, the key skills and qualities you’re looking for, and learn all you can about recruiting. 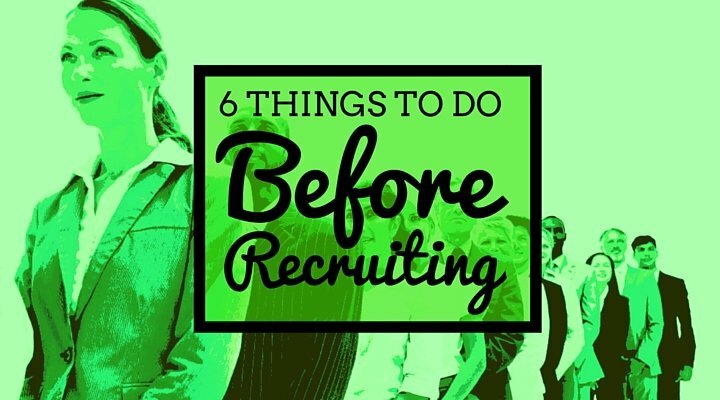 Here are 6 things to do before recruiting and the two interview questions I’ve found insightful in the past. Once you’ve successfully recruited someone, don’t make the mistake of thinking your job is done. Outline the responsibilities of the role but develop a slow and steady plan to hand over these responsibilities. Initially everything will be checked by you, then as time goes on, you’ll hand over more and more of the role. Unfortunately, new hires will take much more of your time in the short term. But the investment in their onboarding and training will pay dividends in the future. Deciding when to hire comes down to a balance between meeting your needs and the business’ abilities to support extra costs. You can’t have one without the other so don’t just wing-it and hope for the best! Take a moment to do your sums and decide whether the business can afford an extra person. Then be very deliberate about the roles you’re filling and in which order. Get the right person for the role and make sure you take the time to onboard them properly. As you grow, the question of ‘when to hire’ will continue to show up, but each time it gets slightly easier!